Look at the old girl now, fellas. 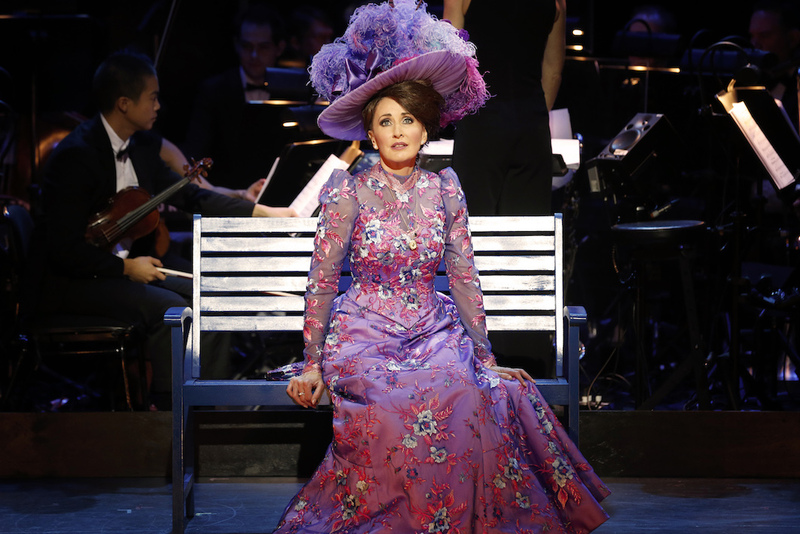 Mrs Dolly Levi, born Gallagher, is back on the Melbourne stage in a glossy, if somewhat scaled down, production of Golden Age classic Hello, Dolly!. Back in 2002, Hello, Dolly! was an unfortunate low point in The Production Company’s short history. Dim lighting, uninspired choreography and a leading lady who hadn’t bothered to learn the words turned many serious musical theatre fans off the fledgling company at the time. Each of the flaws are well and truly repaired in this vastly superior production, the pristine quality of which is a ready measure of how far the company has come in the intervening years. There is a degree of disappointment in the fact that this traditionally lavish show is shoe-horned into the Playhouse rather than the far grander State Theatre, and yet the relative intimacy of the venue contrasts strongly with the current main stage revival of My Fair Lady, the finer details of which are lost in the vast auditorium of the Regent Theatre. 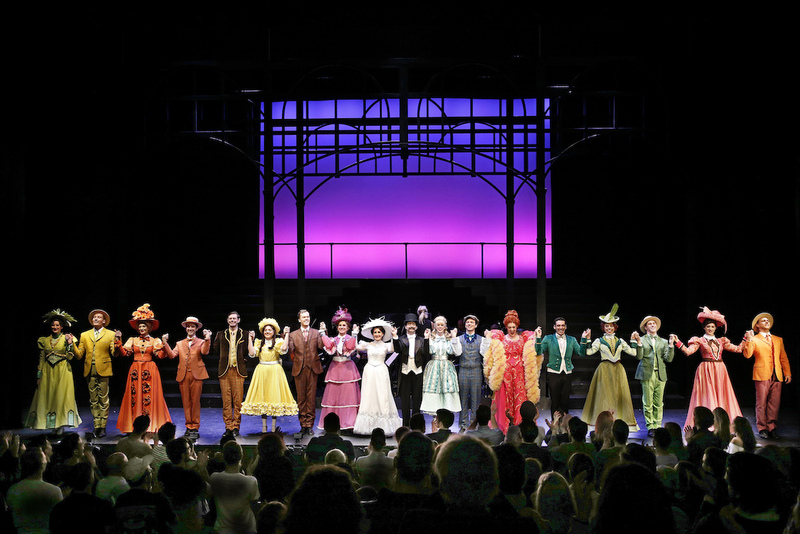 The presence of a sizable contingent from Orchestra Victoria is usually a key attraction of The Production Company shows, so to have Jerry Herman’s revered score played by only 14 musicians is a missed opportunity. The chorus of only eight performers is a similar reduction from a full-scale production, although the tight playing space means that the stage still appears to be well filled with performers. Director Gary Young capitalises on the delectable humour of Michael Stewart’s razor sharp book. Outdated sexist elements are brushed over with a wink and a smile, keeping the focus on the charming romantic aspects of the concise tale. Each and every performer carries themselves with the grace and style that befits a polished period musical. One head-scratching misstep in direction is the omission of a song in act one. With Dolly’s arrival at Mrs Molloy’s Hat Shop, where shop assistants Barnaby and Cornelius are hidden from their Yonkers employer Mr Vandergelder, the slapstick comedy is about to reach a crescendo when all of a sudden a quick press of the fast forward button sees the action skip right over “Motherhood March” and Horace is leaving the store. Choreographer Kristen King’s well-drilled choreography is clean and sharp. The “Waiters’ Gallop” is a clear high point, mixing physical comedy with fleet footed dance from the sensational male chorus. 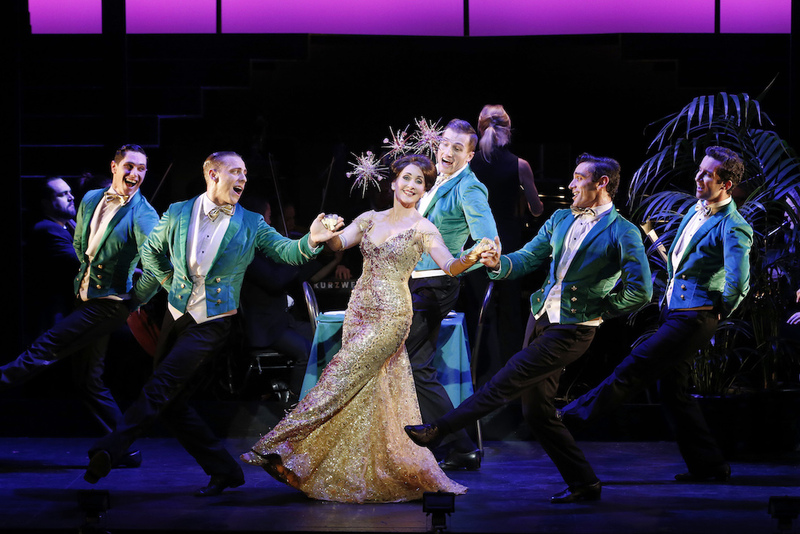 The full dance break of act one showstopper “Dancing” is a beautifully realised sequence. The tight orchestra is heard at their very best under the exacting baton of musical director Vanessa Scammell. Likewise, the full range of vocal harmonies are expertly covered by the relatively small cast. In an unobtrusive touch, Scammell has the full company join the Waiters in singing cherished title number “Hello, Dolly!”. While Shaun Gurton’s economical, well integrated design makes clean use of the available space and aids storytelling with the creation of various locations, it is the costume design of Isaac Lummis that really sparkles. The chorus graces the stage in luscious citrus pastels for “Put On Your Sunday Clothes,” with the women later changing to midnight blue and purple evening wear at Harmonia Gardens. Dolly begins in musk with fuchsia satin trim, and matching feathered hat, before changing to a gorgeous light purple dress decadently embroidered with masses of pink and blue forget me knots. Dolly makes a grand entrance to the Harmonia Gardens restaurant in a glittering gold mermaid-silhouette gown, finally changing to gleaming white for the matrimonially themed finale. When Marina Prior first played Miss Adelaide in Guys and Dolls, it was a breakout from the soprano ingénue roles she had built her career upon. Her versatility now well established, Prior is an absolute natural as Dolly. Although Prior’s dialogue accent wanders slightly, her comic timing is superb. Best of all, Prior gives arguably the most beautiful rendition of Dolly’s songs ever heard from the stage. Grant Piro bristles with Horace Vandergelder’s curmudgeonly cantankerousness, allowing just a teasing glimpse of the good heart underneath. A gifted comic actor, Piro allows the audience to forgive Horace’s sexist demands. Husband and wife duo Piro and Prior enjoy strong chemistry, and their comic skills redouble whenever their characters spar. In a pair of utterly charming performances, Verity Hunt-Ballard and Glenn Hill bring out the full romantic chemistry of Irene Molloy and Cornelius Hackl. With a lilting Irish accent, Hunt-Ballard imbues Irene with a modest grace, and her singing is a joy to hear. Hill brings a fresh, sincere energy that endears the plucky character to the audience. Imogen Moore is a find as adorable hat shop assistant Minnie Fay. An excellent singer and dancer, Nigel Huckle glows with energy as naïve yet enthusiastic youth Barnaby Tucker. Dressed in a puffy hot pink gown that can probably ne seen from the moon, Alana Tranter shines as raucous romantic decoy Ernestina Money. 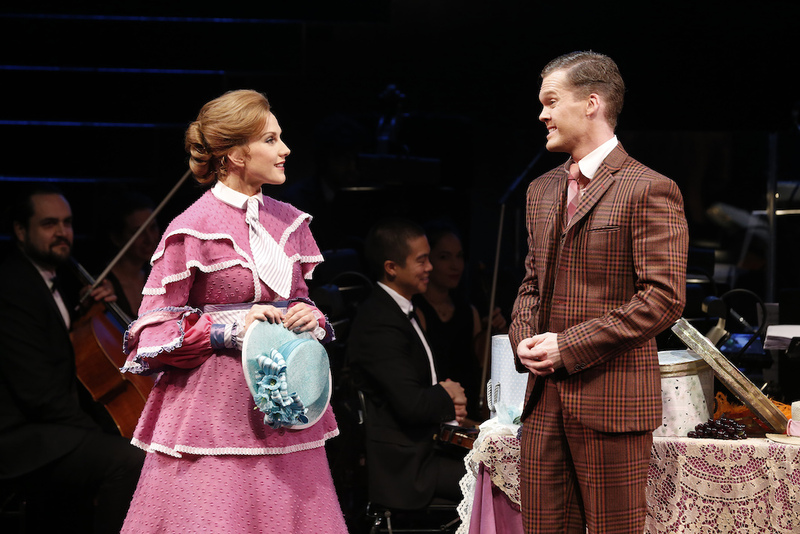 Lovers of traditional musical comedy are sure to enjoy Hello, Dolly!. 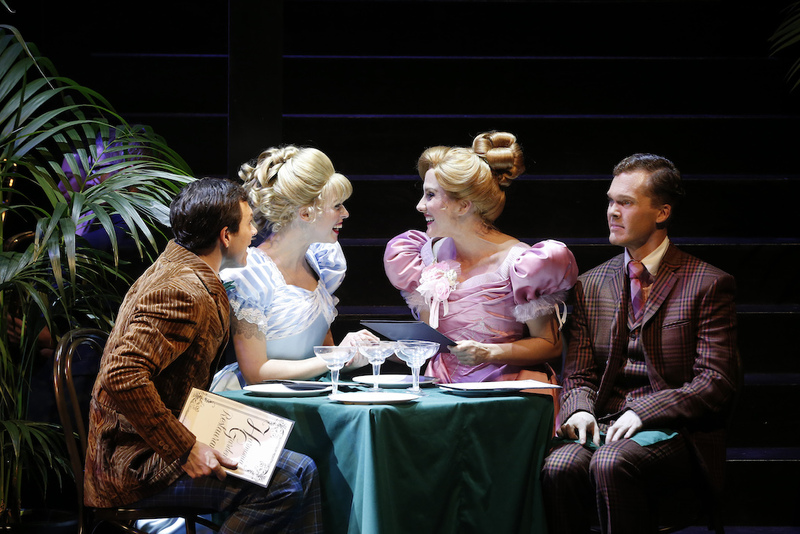 A new generation of theatregoers are also sure to fall under Dolly’s spell. Hello, Dolly! plays at Playhouse, Arts Centre Melbourne until 11 June 2017. 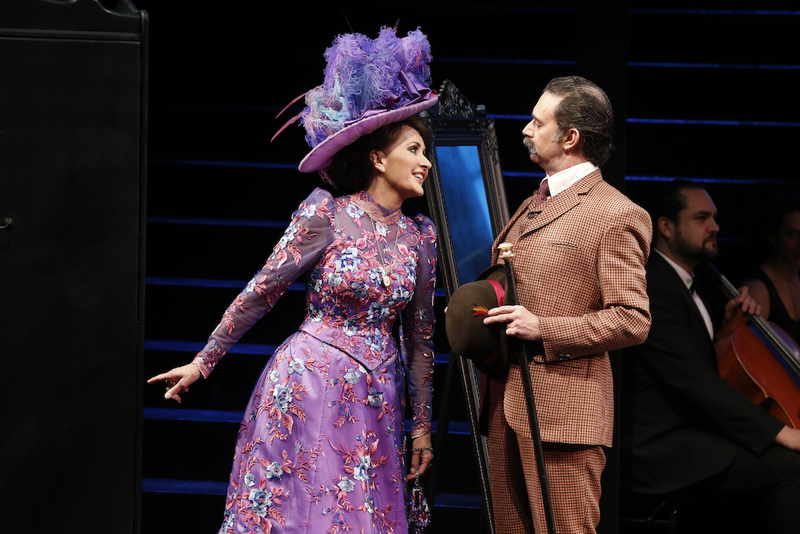 Man in Chair reviewed Bette Midler in Hello, Dolly! on Broadway. Was “Motherhood March” entirely omitted (as in the movie)? Apparently, it was largely written by Bob Merrill, along with “Elegance”. I think both numbers fit well with Jerry Herman’s marvellous score. Yes, “Motherhood March” was entirely omitted last night. Everything was in place for the song and then sudden.y the moment had passed. I had to scramble for the program to check what was going on. An unusual choice from the production team.